The last actual trading cards I did were some Legend of Zelda cards from Enterplay a couple yeaes ago and a case pretty much guaranteed a full set outside of gold foils and box toppers. For whatever reason Transformers cards can't seem to get this concept down. Armada took years to finish off. Despite hundreds of free packs from Robot Kingdom and four ultra cheap clearance cases from BBTS, I still don't have 8 DotM cards. These aren't much different. I get it on the Super Rares and Rares but it feels like "Common" and "Uncommon" mean totally arbitrary things with these particular sets. Who wants to live forever? / Who wants to live forever? They say that all good things must come to an end. They say that life is not beautiful because it lasts forever, but because it comes to an end. Well, unless you're a Highlander, but I already opened with Queen so I'm pretty sure all of them left the room. But like the existential dread-inducing realization that things are finite, so too must we realize that card spoilers must eventually come to an end. 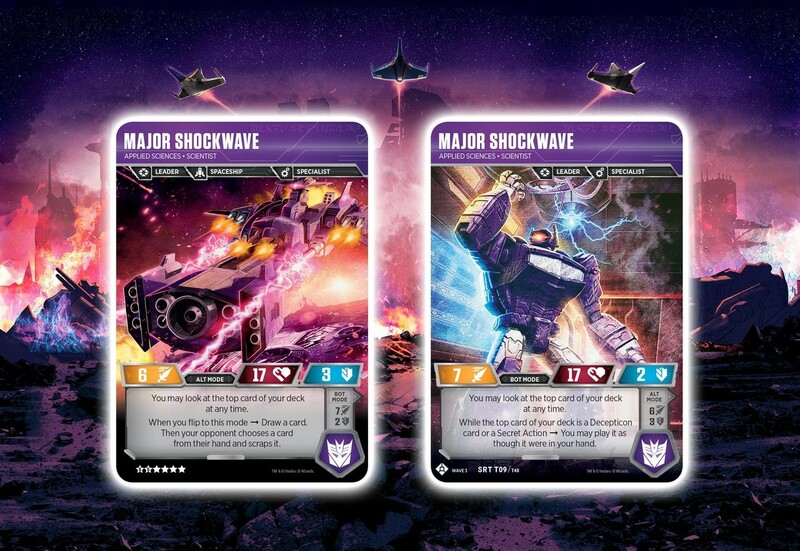 It just so happens that the aforementioned "end" is a cataclysmic, explosive dump of card spoilers on the Transformers TCG Facebook page with an amount of reveals coming in at a solid 33 freaking cards. And I'm going to do all of them. So strap in -- you're in for a wild ride. "And I shall call him... Mini-Me." Skywarp is actually very competent, and I am extremely excited about his potential with an Aerialbot team backing him up. You see, this Skywarp may have lackluster stats on the surface, the thing you have to realize is that beauty is rarely skin-deep. You see, when you have this Skywarp in his Robot Mode, he has an affinity for "pipless" cards that don't have a colored pip on them. When you flip a pipless card, you gain a sizable offensive and defensive boost, making his lackluster attack and utterly abysmal defense stat actually useful for something. If you recall a few days ago, we saw the Super Rare Starscream who has a very similar ability to this except that he deals with the Decepticon Crown. The difference being, Starscream is both more powerful when he works and more expensive. It's for this reason that I can't help but to consider the two to be extremely similar, and I wonder if that wasn't by design. Food for thought. You can use this defensively, chiefly, with an emphasis on Tough to give him an extremely competent defensive capability. His offensive stats are too lackluster to capitalize upon, it would seem, which is slightly unfortunate. But then again, the best part about him, at least in my opinion, isn't his robot mode. You see, when you transform Skywarp you get to put a pipless card from your Scrap Pile into your hand. Skywarp, of course, can put any pipless card into your hand, not just Actions, which means that certain cards like Stunticon Swagger could get even better given that you could play him with a team of Stunticons (though I am not sure why exactly you would choose to deny yourself combination in that regard). But let's think about this in terms of Action Cards for the moment, hm? So, let's say for instance that you have three Aerialbots along with him. Remember that kinda nutty Bombing Run combo I was talking about where you could do 8 damage to something in total without attacking? If not, let's recap: You start with four Planes, then you play a Brainstorm. Brainstorm will then play a Photon Bomb, damaging all characters on both sides for 2. 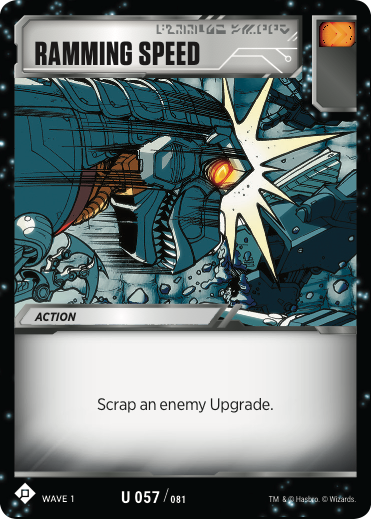 The second card comes, and it's a Bombing Run, which moves a damage from each of your Planes to a single target. This turns the 2 damage from the Photon Bomb into 6 given you have four planes in play. But that's not all. Next, you get to transform Silverbolt into Robot mode and put another damage counter on something, then you get to attach an Armed Hovercraft and spread another 1 damage on your opponent's characters. This brings the total damage you've done to a single target -- not counting the other spread damage on your opponent's other characters -- to a whopping 8. And you haven't even attacked yet. Skywarp helps make that combo way more consistent. Being a Specialist, a Plane and having the ability to return the Photon Bomb from your Scrap to your hand, he allows yourself the ability to confirm a part to the combo in your hand as well as potential Multi-Mission Gear plays. You have a lot of potential value out of Skywarp from his vehicle mode ability alone. I just wish that his offensive stats were a bit more than lackluster. All in all, he's great utility. He'll never come close to either Battlefield Legend or Starscream, but he has a very nice niche in spammy Aerialbot-based lists. I mean, sure, seven attack is actually kind of big in Ruckus' robot mode, and being a Car allows him to swing more than once, but almost everything else about him is just... Vanilla. His Car mode has a nice 3 Defense, though, so there's that, but at 11 points there are just better options. Like, a lot of better options like Wheeljack, Cliffjumper, pretty much any Bumblebee... You get the picture. Cool artwork, better name, bigger pass. "I feel like a gold bug!" Robot Mode: "When this character has 5 or more damage counters on it, it has Tough 2." Alternate Mode: "When flipping to this mode, this character has has Bold 2 until end of turn." 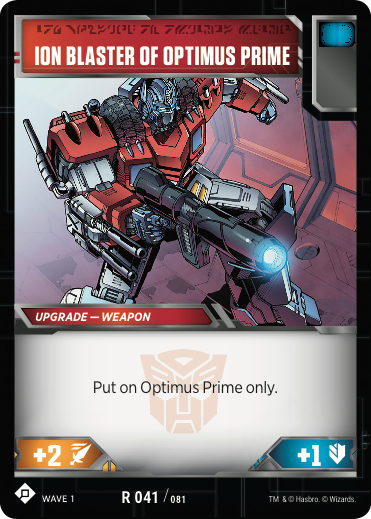 So, if you couldn't tell, this card is P1, the other Promo coming out for Rise of the Combiners! I had a quick conversation with the official marketing team on the Facebook team about its availability and as it turns out, it's only available in China to celebrate the Lunar New Year as a Buy-A-Box Promo, shown HERE. Sadly, this means we won't be getting this card at all in the United States or in the United Kingdom, and they were quick to state how they didn't want to distribute it outside of Asia so we can't get our hands on it outside of simply importing one likely at a premium. Bumblebee himself is excruciatingly mediocre in the stat category -- I mean, 8 HP for as many stars! 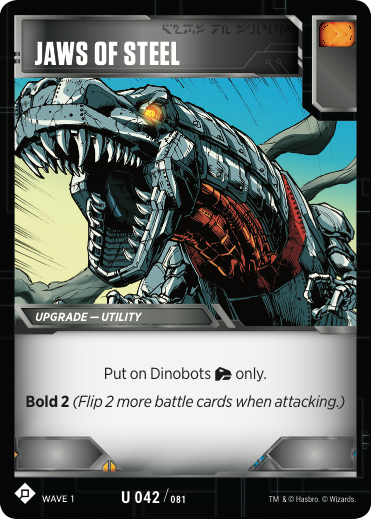 -- but when you consider that his Bold ability in his vehicle mode stacks with Wave 1 Prowl, Power Punch and Supercharge, you're going to be flipping a whole lot of cards coming in at a Dinobot-level Bold 10. That's more than Wheeljack can pull off, and all Bumblebee needs to do is play a Start Your Engines to do that combo. His robot mode is pretty to look at, but abysmal to play with given he's more or less vanilla until he's almost dead, in which case he has an innate Tough 2. That's fine, but when you consider that he only has three HP remaining it becomes a whole lot worse. If you want my opinion, just run him in Wheeljack and hit really hard with him -- it's easy enough to do! No Loot Crates here, just cold, hard, disappointment. Not that the card is bad or anything, I just hate that I'm going to have to spend a premium to get it. Where does it get that value from? Well, it's pretty to look at, it's actually startlingly competent in a Car list and it's exclusive. What else do you need? "My shots are really inaccurate with this fog. You could even say that..."
Fog of War is a fantastic card for hand control lists, and it's easy to see why. Discarding both players' hands down to two cards not only makes it extremely easy to control your opponent's hand from there, but also extremely easy to simply discard the other two. Take for instance Shockwave, who is both a Specialist and someone who abuses effects like these. Using Shockwave, you can use Multi-Mission Gear to play a Disruptive Entrance, leaving your opponent with only a single card in hand. If you have a Brainstorm, you could even use the Disruptive Entrance without using your Upgrade for the turn, instead using a Rapid Ascent on a Ranged ally to Scrap your opponent's last card. Now, whether this is good in a game that requires very little hand commitment in order to deal damage or not is simply reliant on the power of characters and the power of played cards from the hand. In a game where the characters are extremely powerful and less reliant upon their hand to deal damage, this combo isn't as great. But with the advent of more powerful Action cards and Upgrades in this game, the more I begin to realize that hand destruction might be better than I give it credit for. Good to know that Superion also plays with action figures. This card isn't that great, not gonna lie. It's good, don't get me wrong here, and it will definitely replace The Bigger They Are in Double Prime, but the problem is this: When you're markedly bigger than your opponent, your attack is usually far higher than their defense. In other words, in all likelihood you won't need Pierce to deal damage unless you're facing down an extremely beefy Demolisher. Let's be fair here, though. There are certain things that can make use of this against lists like Aerialbots, Trucks, Stunticons and similarly defensive lists with smaller characters. Most of them have five stars and a small set of HP, and when your own damage output is low you might want to make use of this card. Again, I don't really think that this card will see wide use. But it will probably see niche use in the terms of Double Primes and Tanks. Surprisingly, I do like this card. In terms of most lists, you won't really find much use for it, but with Brave Combiners you most definitely will. You see, in terms of standard lists you simply don't have the resources to tap one of your characters outright and open them up for attack, but in wider Combiner lists (preferably with a Brave character on-board) you have a startlingly good draw card. Again, it's situational, but to be perfectly frank there are uses for this card. In anything else, I would say that it's bad. I mean, you're effectively removing an attack from the field when you tap a Specialist -- and that's not great, especially since your Specialist is now open to attack. 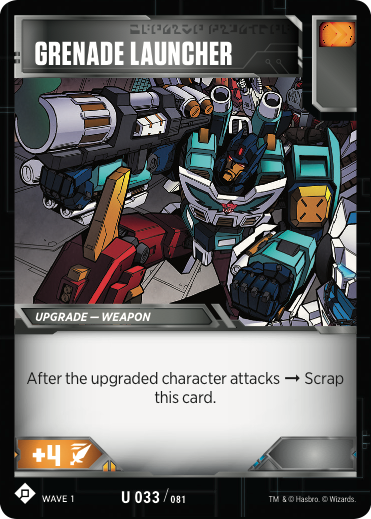 However, when you have a Brave character on the field like certain Combiner lists, you can use this card with relative impunity. I don't know how much this will see play if at all, but I do think that it's worth a try in Combiner lists to put some solid draw in the mix. "I've got him dead-center in my viewfinder!" So, I don't know how to feel about this card. On one hand, it seems like a much better Plasma Burst given that it has a pip instead of Plasma Burst's lack thereof. But on the other, it seems like a less consistent Plasma Burst given that your target has to be in Robot Mode. 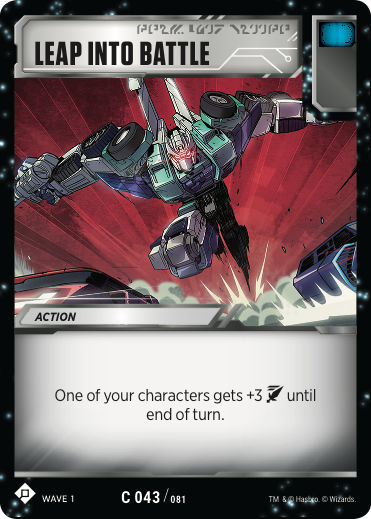 Regardless of its requirement to have a Ranged character on the field, you can't ignore that your opponent can just transform one of their characters into vehicle mode to avoid this card altogether. Although, there could be a case to be made that the threat of this card forcing out one of your opponent's transformations for the turn or perhaps changing the gameplan from the start of the game to avoid the card altogether. But at that point, wouldn't you rather just play a Plasma Burst and punish them anyway? But therein lies an interesting thought: Redundancy. You see, Aerialbots use Photon Bomb, Armed Hovercraft, Bombing Run and other damaging cards to make plays -- this could just be another one of those to make their combos more consistent. In Pokemon, it's wise to play multiple search cards not because you have more Pokemon to search, but because you just need to find them quickly. 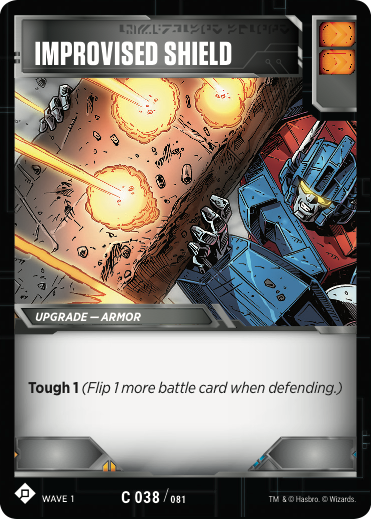 In the fast-paced Transformers TCG, you will definitely need to find your combos just as quickly. So, I pose this question to you: If you're already playing Plasma Burst, why not add this guy in to make that just a little bit more consistent? Just a thought. "Well, I have a big head... And little arms. I was really wondering how well this plan is thought out." So, in other words, you can put your entire hand on the top of the deck to not only rig what you're going to flip now, but on your defense as well. This effect is fascinating, and I am extremely interested in it. I mean, imagine using it with Mining Pick which gives you +1 each time you Plan, a card that already gives you Plan 2. You'd be giving yourself Plan 8, and if you happened to have that many cards in your hand, you'd be giving yourself a monstrous +9 attack including the +1 the Pick already gives you. Not to mention the cards you already put on the top of the deck to increase your damage further. But the problem is this: You need a massive hand to make use of this, and that is a bit of a problem given that you're constantly decreasing in hand size. But, if you happened to have a deck to support such a massive hand, this might be a potentially game-winning maneuver. Put it this way. Say for instance you have a hand with several double pips of varying colors, a white pip and a standard orange. Normally, this would likely be a bad hand. I mean, bad enough to draw one of your double pipped cards, but drawing that many would be a severe handicap. With Master Plan, you can put all of those on top of the list in a very specific order. If you're playing a balanced list, you can rig your next attack with orange pips and your white pip, leaving double blues on the top of your deck to rig the optimal defensive cards for your defense flips. Rigging both offense and defense is a surprisingly good effect, and flipping the right cards at the right time can be kind of insane and put you extremely far ahead. It also makes Metroplex swoon, given his effect requires a certain combination of potentially six cards on the top of your deck. All in all, I think this card has a ton of potential. It will most likely become a staple in Metroplex, but other than that I don't quite know what else would play it. Perhaps balanced combiner lists, or any balanced list in general, but otherwise if you're playing mono-color, stay as far away as possible unless you're wanting to make a Energon Pick shenanigans deck. "Many of you may die... But that's a sacrifice I'm willing to make." Hey, it's Pot of Greed! And it's good in this game too! Whodathunkit? Like, actually, Pep Talk is pretty good, I'm not gonna lie. Nothing quite like adding cards to your hand, especially early game. Whereas I don't know if this would replace Inspiring Leadership, which may just be the better blue draw card given that it shows you more cards from your deck and you can get pesky Handheld Blasters out of your hand, it might be a good supplemental draw card. I mean, what's wrong with Pot of Greed, right? After The Neptunes broke up, Clamhead and Jabberjaw did a solo gig. They still get no respect, no respect at all. R & R is bad. No, seriously, there are so many better cards that do other things that can also heal your characters while you're doing them. Take for instance Fling or Salvage for Parts. Fling can damage an opponent while Salvage for Parts can scrap their Upgrades. Thing is? Both of those cards are more or less unplayable and they're both better than R & R. So what does that tell you about this card? Hey, at least it's better than Underhanded Tactics! Ever since The Laughing Man incident, security cameras have been so encrypted that even the people watching them have no idea what's happening. Security Console is so good. Oh my god this card is so good. Okay, lemme calm myself down. So, basically, in the first set, there was Data Pad, which was an offensive Plan effect that doubled as a draw card. It was pretty darn okay, but there were usually better cards to play during your turn. Good utility, but still worse to attach than a Weapon. Now we have an Armor, and I couldn't be happier. So, what makes it so different? Well, Data Pad wasn't that great because you could only effectively use it once. Since you're going to wait an average of three more turns to attack with the Upgraded character again, and there's a chance that your opponent has focused them down in that time and you don't exactly reap too many benefits for its existence. Security Console is different in that it works in the opposite way. Upon defending, you can rig your topdeck to not only be defensively inclined but also draw a card. Whenever your opponent attacks you, you get another card. It's a great draw effect that -- depending on the value of the target -- can net you way more cards over the course of a game than Data Pad. I'm extremely excited to use this with Starscream -- Decepticon King, constantly reusing Decepticon Crown and putting it on the top of the deck. You constantly spam the crowns during a game, but the problem was getting them on top of the deck during your defense. Now you can, and that makes me super spooked because Starscream is kind of super good, and this kind of pushes him into a really good potential spot in the meta. 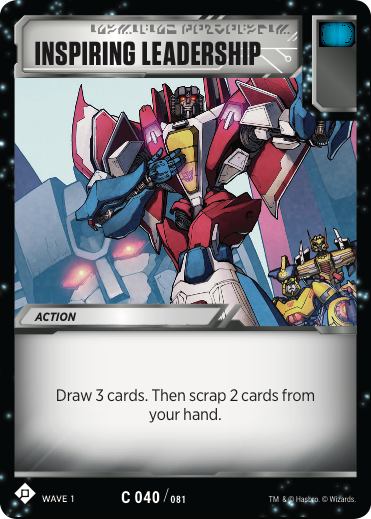 I mean, it even states "Plan" on the card, so you can use Starscream's effect to return it to your hand if you need it immediately. All in all, with defensive decks, I couldn't be happier. Though, then again, it is a card that just makes Double Primes just straight up better. But hey, it kind of makes everything else better, too, so it balances itself out. Lots of love for Skywarp in this set, isn't there? Sonic Scramble is actually, in all honesty, the best card for hand destruction decks in the game, and I firmly stand by that statement. Computer Sabotage is good and so is Fog of War, but Sonic Scramble takes the cake. The fact that Sonic Scramble not only discards up to three full cards from your opponent's hand, but that it refunds your expenditure by drawing three cards (when all three are played at once) is actually fantastic. All other disruption cards have no such bonus, let alone a positive effect for you at all. I mean, Security Checkpoint discards cards from your hand along with your opponent's, Salvage For Parts scraps your Upgrades as well as your opponent's... You get the picture. Speaking of disruption cards with a drawback, Sonic Scramble definitely has its own and it's that you need all three of them in your hand at once. Remember, you can only put one green pip into your hand per battle, and if you ever happen to flip multiples of this guy without using Wave 2 Swoop, you'll be up the proverbial river. But, if you can manage to get all three in your hand, you can use effects like Bumblebee -- Trusted Lieutenant's where you can use a free Action, then using them in tandem with a Computer Sabotage to completely discard your opponent's entire hand. Now, again, hand destruction isn't the best strategy in the game, but it should definitely be noted that your opponent having zero options during their turn is always a good thing. Sonic Scrambler is a definite inclusion in every hand destruction list, but the question remains on whether or not hand destruction belongs in the metagame outside of key Action-scrapping turns. Thundercracker is being shot in this picture. At least, I... Think so? Backup Beam is not good. No, seriously, just play Scoundrel's/Noble's Blaster instead of this thing. It's a Blue pipped Bold card, which isn't inherently bad given Power Sword's current competition with Flamethrower in certain lists, but it's only Bold 2. Now, you might say "Wait, aren't you going to be doing more damage with Backup Beam than Scoundrel's/Noble's since you're Bold?" Well, yes, but actually no. First off, with the advent of Acid Storm, pretty much all Bold is on constant shaky ground given Acid Storm's splashability, but even moreso, since you're playing blue cards in your Bold deck now, you're more likely to whiff on that key offensive power when you need it. If you play any blue cards at all, at least S/N's Blaster deals confirmed damage. Worse yet, Flamethrower is often included as a redundant weapon to offensive lists. Of course with Power Punch and Erratic Lightning likely to replace it, you can imagine how that affects Backup Beam's chances. Sparring Gear is sort of okay, but in the same boat as Backup Beam. Sure, they both have green pips and another pip that is the antithesis of what decks that play them hope to use, but there is a silver lining: Warpath, or rather, the lack thereof. 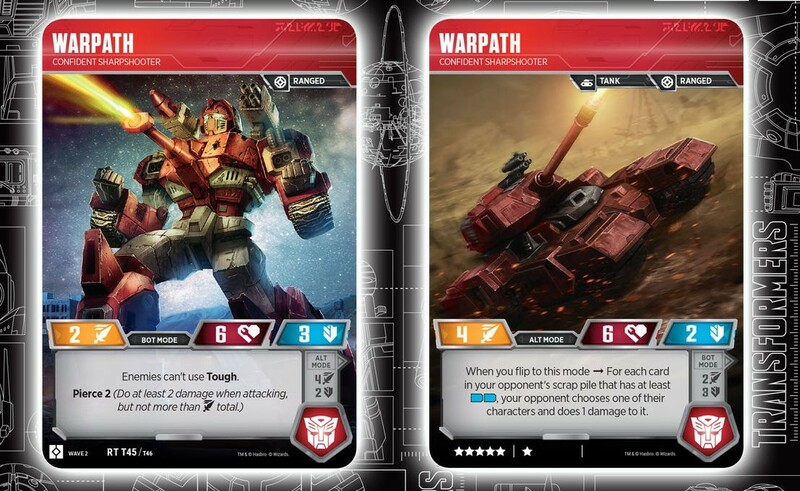 Warpath will likely not be played as much as Acid Storm is going to be, making his ability far less common and as such, making Tough more likely to stick than Bold is. But, still, being an orange pip in hopefully an all blue deck, you have to be pretty darn good to be included, and with something as mediocre as Sparring Gear... I just can't justify it in most lists, with perhaps the only exception being Balanced Tanks. Either way, I don't think that either card will see play outside of sealed events. Together, more or less in line / Just keep truckin' on. Okay, so let's say you're playing a late-game match between Double Prime versus some scrub from your local tournament. Basically, it doesn't matter who you're facing because this has always happened to everyone: The dreaded one-damage-off, the victory so close from your grasp, the sweetness of triumph so near your lips, but it's tugged away from you at the last moment when your opponent's useless Headstrong is left with a single HP and you have no choice but to attack into him a second time. More resources, more attacks... Basically an all-around horrible trade. That's where Steamroll comes in. Remember Grimlock and how good he was with his innate ability to use that bleedover damage? Well, now you can have that on an Action. Now, instead of wasting another attack on that 1 HP Headstrong, you can instead swing for however much you like into him and let the bleedover damage deal considerable damage to one of his allies. Steamroll allows an over aggressive deck to abuse its firepower to its fullest extent, and in a game where a single Force Field can stop an offensive push from KOing the smallest of characters, you'll find the value that Steamroll gives is definitely useful to a lot of lists and I think its play will be something but an inevitability. "Research Note No. 343: As it turns out, sticking a fork in the wall outlet is not as good of an idea as I hoped. This card seems horrible. I mean, it's literally just a green pip! It's an Action that does nothing! What could possibly ever come of this? Ada Wong about to give Leon S. Kennedy a rocket launcher to finish off a mutated leadership figure for the third time in a row, colorized. Oh. Well, that would explain that. So, this card is okay, but let me ask you something: In an all offensive list with very little staying power, do you really need your weapons to stick? I mean, you're going to be attacking with that character once, maybe twice before they go down, so lemme reiterate, will you have a chance for your weapon to stick? The answer is unequivocally "no". Seriously, if you know me you know how little I care for Pierce, so when you see a card with that keyword on it, you can guess how I feel about it. That being said, of the Pierce cards we have, this is probably the best one. As I said, high Pierce is actually good, but the amount of effort you have to put into this card is simply too much to make it viable. 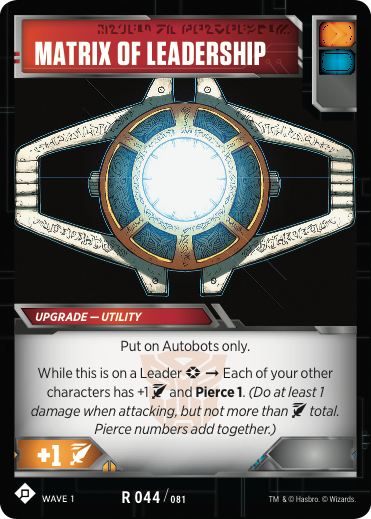 That being said, if you are playing a Tank deck that enjoys high amount of Pierce that will already be playing the card below... Well, I could see saving a seat for Jetpack. I can't see it that well -- like a seat at the very back of the movie theater that you're really unsure of why it's there -- but I can definitely still see it. Well, it is called Armor. Superior Plating is what happens when Reinforced Plating does a line of cocaine and washes it down with three cans of of Four Loko. It's a spastic card to play that could end up clogging your hand down with several unplayable copies of a card, or explode your field with nigh invincible characters. 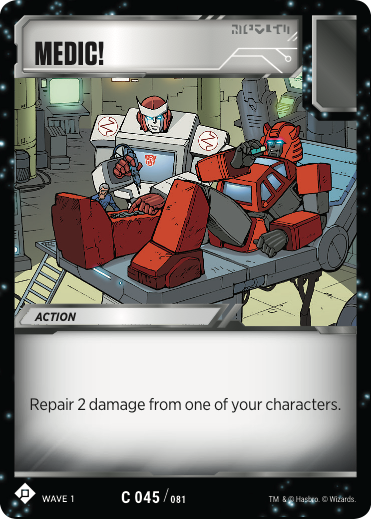 What makes this card even more interesting is that both Jetfire and Hunker Down can play it from your Scrap Pile more or less for free. This means that you can circumvent the normal rules of Tech Research + Superior X to get this busted card into play with less risk than its counterparts. The fact that you can use this in Tanks makes me extremely interested in their possible ability to defend against pretty much anything. Seriously, this card can tank -- no pun intended -- a ton of damage for you, essentially giving your character a +4 on defense at all times, with variation to give you likely way more than that given white pips and double blue. Naturally, you could end up flipping blank cards, but I wager you'd be playing more of the former to raise the average defense you're getting off it. I cannot wait to see how this card plays out. The biggest problem I see, though, is the necessity of playing Tech Research to at least declump your hand mid to late game after inevitably drawing into these guys instead of discarding them off an attack. But, seeing as it has a green pip, it's at least easier to do than not at all. Not the best card to be playing on your turn, for sure, but it's at least nice to have the option to play them from the hand. All in all, the entire combo is fascinating and I think that it will definitely see play. Dreadwing, Tanks, Double Primes, pretty much anything that uses Tough will like this card. Where the others fall behind compared to alternative cards in the game, this one really stands out from the pack as being an immensely powerful Upgrade. "This isn't that fake scrap they try giving to you at Maccadams; this is the real deal!" This card is really bad. Well, let me clarify: It's not bad per se, but it's almost certainly not good by any stretch of the imagination. So basically, Spare Parts is there to prevent your Force Field from being Scrapped by your opponent before you can use it, or your Superior Plating that you worked so hard to achieve. An admirable goal, if it did anything for you. You're essentially wasting an attachment just to say, "Ha ha! Now you really can't get rid of the card you could have gotten rid of last turn!" and feel extremely happy about yourself when your opponent gets the shocking idea of simply attacking you. When I say that they could have simply gotten rid of your Force Field last turn, I mean it. They actually could have simply attacked into you with a smaller character to pop its effect, or use a Ramming Speed or a Drill Arms, and now even Smelt and Vaporize have been printed. It's just a bummer to play on your turn when you could be playing either another armor or another weapon and I am extremely disappointed in that regard. This card doesn't do anything. Don't play it. Testify is a pretty good card. Coming off the first set, there were only two cards that left you with more cards in your hand after playing them (Team Up Tactics and Equipment Enthusiast, respectively), and the only orange draw card amongst them was Incoming Transmission that simply replaced itself. Not a bad effect, and putting a pesky Improvised Shield on top of the deck is always useful, but more often then not you're simply putting a card you don't really want to Scrap on top of your deck. Testify seeks to remedy that by simply giving you access to Pot of Greed for both players. Now, whereas you will be giving your opponent two cards too, you can use this to your advantage in certain decks that abuse hand size. As an example, Shockwave. Now, I don't exactly know if this will replace Incoming Transmission or not, but when you consider that most orange decks have a constantly decreasing hand size, you start to get the picture that drawing more cards is pretty good to help mitigate that. After all, what's better than card advantage? "I'm so glad you asked, because I'd like to take this moment to elaborate on my evil plan." I get it, you see a card that says, "Draw three cards" and you begin to lose your mind, but need I remind you: Universal Network Access is a Star Card, and that means you're going to be playing one, maybe two Star Cards in your deck depending on the list. When you realize that, and when you realize that Leap of Faith is actually kind of insane in terms of value, this measly draw effect pales in comparison. There are just better options out there, man. Don't spend your deck space on this. "Mr. Magnus...? I don't feel so good..."
Vaporize is actually really good for Double Primes, and the big reason is Battlefield Legend. I've spoken in the past about how good Battlefield Legend is, and one of the best things to do about him was to bait him into wasting the monstrous 8 attack that he gets on something that he can't KO -- likely something with a Force Field on them. Now, sometimes Double Prime played Ramming Speed, which is literally the same thing as this but with an orange pip, but the orange pip sometimes made their defensive abilities less consistent. This is a more consistent version of Ramming Speed for Double Primes, and I can't really see any reason why you wouldn't play this card. Again, I've spoken in the past about how bad Ramming Speed is in non-Prime decks with few exceptions, but this really takes the cake in terms of being "just for Primes". Fantastic in Primes, but not anywhere else. I hear he's a pretty cool guy. That's the entire thought process I had when writing this segment of this article. I first thought about in Planes, then I remembered that you'd rather be attaching something like an Armed Hovercraft or something similar. Then, the thought struck me: Tanks! Tanks are almost entirely Ranged, and using an Armor to heal on top of your Medics can't be bad. The only problem is, it's an orange pip. I suppose you could still play it in an already tight list in terms of pips, but I guess it always balances itself out by healing off whatever blue you missed on your defensive flip! All in all, I don't think this thing will be played in anything else other than Tanks. There just isn't anything that would really make use of this bar maybe a heal-focused Plane list, but when has that ever happened? First off, can I just say that if a flying sauropod happened to crash land in front of me on a Sunday Stroll, that I would probably never go outside ever again? I mean, you never know what other flying dinosaurs are out there, ready to fall on you -- big risk! But in all seriousness, Crash Landing is a freaking insane card that I am in love with. It makes Ramjet actually an extremely appealing deck, it makes Sunstorm an extremely satisfying prospect and it makes the Aerialbots even more powerful than they already seem. Seriously, this card enables all of them to be potentially extremely oppressive. I mean, let's take Ramjet for example. He starts off at 7 attack. You play a Swindled and you happen to attach an Erratic Lightning to him. You then attach a Crash Landing for turn and you swing at someone for somewhere around ten damage to Nemesis Prime. Your opponent then turns around, miffed that you hit them so hard with a vanilla common, and straight one-hits him with a very angry Battlefield Legend. That's when the real magic happens. Now that you have an Erratic Lightning on Ramjet, he has a base attack of 10. That means Crash Landing activates and deals a solid 10 damage to a tapped target -- in this case, Battlefield Legend -- either softening them up for another swing with one of your partners or just killing them outright. Just think. You can even play Ramjet with Skywarp to more or less confirm the Crash Landing will be attached to him using Skywarp's vehicle mode ability. Instead of Skywarp, you can also partner him with Thrust to deal even more freakishly high damage to your opponents' characters. I for one welcome our new Plane overlords. "Mom says it's my turn on the X-Box." Hey, a double blue pip! Much like the Mounted Missiles card revealed earlier, Energized Field is the third double pipped card you can put in your mono-color deck, effectively making it more consistent and more defensive. The effect of its sister Star Card, Mounted Missiles, was a welcome one with its ability to essentially "keep" its double orange effect on the field through Upgrading, so how does Energized Field stack up? In terms of effects? Not that well. Well, let me explain. On one hand, Mounted Missiles allowed you to keep the pressure coming by attaching it alongside a weapon if you ever happened to draw it. This almost offensive double blue does the same thing where you expected it to do the opposite. Where you would expect it to have a similar effect (for instance, attaching it in your Utility slot and giving your character more defense), it instead relies on orange pips to activate, dealing damage to attackers if you flip an orange. That's fine, but when you consider that you're going to be almost entirely blue, this is an extremely rare effect. I can't help but to wonder at what could have been, how good it would be if it had the effect of, perhaps, turning all non-blue pips -- even non-pipped cards -- into blue pips, or perhaps a +1 Armor that also gave you some degree of Tough, then you could definitely justify attaching it. But as it stands at the moment, I just can't. Good in your deck, but not in your hand. This card is a straight up worse Armed Hovercraft. I mean, I get it, you get to use it on a Melee character, but when it has a blue pip, how can you justify it in aggro lists that most Melee characters find themselves in? Okay, I get it -- Double Primes are both Melee, but they just don't need to place a single damage counter. I mean, if swinging for 11 on average wasn't enough, right? 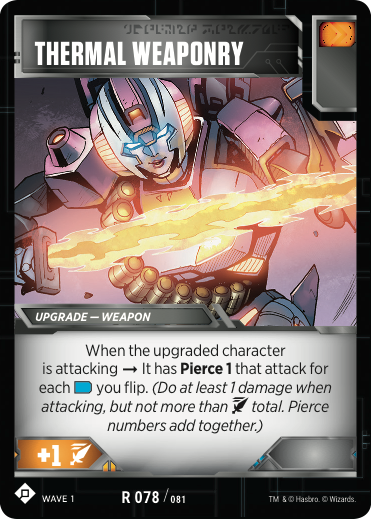 So, I struggle to find a use for this card except maybe -- and I mean, big maybe -- Stunticons to try getting some poke damage in while trying to combine or set up a big Motormaster play. I'm sure that this card will make a great proxy back, though! 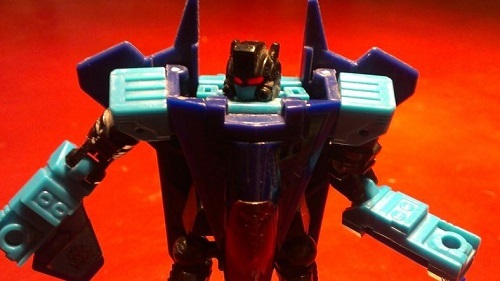 No, really, what's up with all the Skywarp!? Espionage is a pretty cool card, I'm not gonna lie. When you consider that all Enigma cards are green, and the fact that your opponent is not likely to have more than one in their hand, you can scrap that Enigma before they get a chance to combine and essentially deny them their combiner for the game. How you know that they have an Enigma in-hand is easy: You know that your opponent put it into their hand when they flipped it since it's green, and if they don't put any into their hand from their flips it becomes pretty obvious that they have one in-hand. That is something I love about this card especially: Reading your opponent. Bluffing your opponent. Interplay. Too often cards can boil down to "deal damage, but harder this time" and that is unfortunate. I really enjoy how much damage you can deal with this card, not to your opponent's characters, but to their strategy. It's a very strong thing to take what your opponent has when they need it, but the fact that it technically can't take cards that are pipless is a bit of a downer. It makes it balanced! But it's a downer nevertheless. Something that makes this card even more powerful is the fact that it's green. You can pretty well find it more or less whenever you want through Bold or Tough numbers, and you can pretty well dominate less than experienced Combiner players by abusing the fact that you can pretty much get it at any time. All in all, I absolutely adore this card. It's so strong at so many things, and it can cripple your opponent's hand outright. 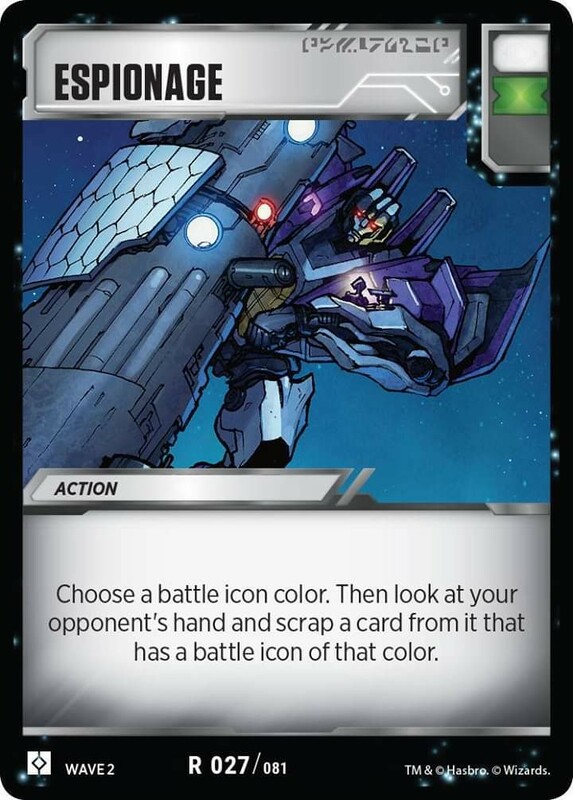 The fact that it's a green makes it even better, and when you consider that you can deny your opponent a Combination for the entire game, you begin to realize that this -- not Cornered -- is the real Combiner Killer. At least someone dealt with the Skywarp takeover. Yeesh. So Enforcement Batons (and Bashing Shield down below) is kind of the antithesis of Drill Arms and Scrapper Gauntlets. The pips are swapped, the effects are swapped and the draw is gone, instead gaining a green pip for added consistency. As for Enforcement Batons, I have never liked weapon scrapping effects given the abundance of Grenade Launcher, low defense attackers and now the advent of Power Punch which is basically just more Grenade Launcher at this point. The same rule applies here. You don't really gain anything other than +1 attack, and at that point, why even play it? You aren't punishing your opponent's weapons all that much, and you're not drawing a card like Scrapper Gauntlets does. The answer? You wouldn't. Unless you're terrified of Superior Blaster, of course, then this card becomes a pretty alright answer to it. Not perfect by any stretch of the imagination, but it's still a competent niche card to counter that niche card. But again, niche is niche, and I wouldn't recommend filling your deck with niche techs against something you may never see lest you want to tank your own consistency against everything else. "The Tracer mains run in fear and dive for cover as the pre-nerf Brigitte enters the battlefield, hunting them like a vast, predatory bird. GOATs Comp had been coming, but now? Now it was here." This is something that I can get behind more. Getting an Armor that scraps other Armor in offensive lists is a pretty interesting idea, and when you consider that you can put Bashing Shield on an already high defensive character like Headstrong or Thrust to amplify their survivability in an orange list, you can't really go wrong with it. Normally, I would start into a speech about Power Punch or Grenade Launcher, but when you consider that this is an easy, surefire way to get rid of Force Fields when you need them gone, I can't say too many bad things about Bashing Shield. I honestly really like it, and I can't think of too many offensive decks that wouldn't like to play it if for no other reason than to get rid of the almighty Force Field. Attack Drones are a poor man's Erratic Lightning, which is weird given that Erratic Lightning is a Common. No, really, this card deals a solid +3 damage for a three card investment, compared to Erratic Lightning or literally any other weapon that gives similar numbers for only a single card's investment. Okay, so there has to be a reason to play Attack Drones, then, right? It's not all doom and gloom here. Well, not usually. So, what are the positives here? Well, for one you can play all three from your hand instantly instead of waiting three turns to attach all three like Cargo Trailer, and they have green pips which is pretty neat, but I think the most important reason to play them is for cards like Chop Shop and Equipment Enthusiast. Equipment Enthusiast refunds you for all your Upgrade expenditure and then compounds that into massive draw later, but I think Chop Shop comboing with that makes for an even better draw effect. Something that Chop Shop does is, for every Upgrade on him, you can scrap them and both heal one damage for each and draw one for each. When you have three Drones and an armor, for example, you can scrap all four of them to heal him by four and then draw four cards. You can use Equipment Enthusiast to essentially refund your Drones, then Transform Chop Shop to effectively double the amount of cards that you had initially. 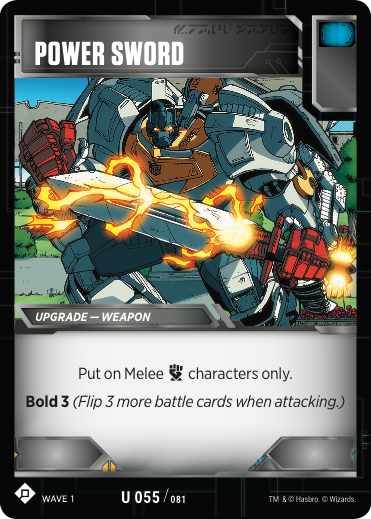 It's a niche use, of course, given that Chop Shop sees limited use in the first place, but that is a lot of draw to burn through your deck with and I can't wait to see how people are going to use it. "The ancient scroll of wisdom!" The scroll unfolds to read, "You need therapy." So, basically, this is a Combo Card that deals heavily with the next card, so I won't go too much into that combo just yet. But, I do think that Ancient Wisdom in a vacuum is rather mediocre, to be perfectly frank. Of course, used on its own, Combo Cards are always going to feel like a bad play. Sometimes, though, you might have to use it for its pseudo-draw effect. It's not the best, but at least it gives you something, unlike Tech Research. There really isn't too much to write home about this card outside of the combo. I mean, it automatically replaces itself with one of your two cards on the top of your deck at worst, and increases your hand size at best, but it's kind of hard to get excited about the idea that you can't just draw them unlike some other Actions. But anyway, on to the combo! Either Windblade is having a bad trip or that is some impressive graffiti. Hoooooo boy, what a brain teaser. So, Unleash Potential is a card that pulls things out of your binder to put into your hand. Unfortunately, you can't put anything into your hand, but putting a Star Card into your deck regardless of whether or not you have 25 stars already is a pretty cool thing. I mean, you won't really do anything with it other than take a Leap of Faith out of your binder, but it's an interesting concept. You see, you could take Bolt of Lightning and use it the next turn, but at that point, why aren't you just using One Shall Stand and just bite the bullet on the recoil damage? Instead of putting a Universal Network Access in your hand, why not just play a Pep Talk? Instead of going through a massive amount of rigmarole to pull something out of your binder, why not just play a similar card in your deck? I simply cannot answer that question, and for that reason I cannot recommend this combo. I realize that putting a Leap of Faith into a list that couldn't before sounds good, but when you realize all the effort it took to finally use it, you'll start to see what I mean. I mean, imagine, fighting through the inconsistency of getting both Unleash Potential and Ancient Wisdom in your hand, finally getting a Leap of Faith in your hand to use the next turn, only for your opponent to play a Disruptive Entrance, transform Mirage or use Espionage to scrap it before you can even play it. That's reason enough not to play it. Inconsistency can be surmounted through superior draw (like Cars), but when you consider the fact that your opponent can just scrap the card you took forever to finally get through an Action of their own, I can't justify playing this at all. I mean, you can always use Recon System or Energized Field, but why go through the effort at all at that point? Sadly, the most interesting card combo is also one of the hardest to justify in a list. I realize what the guys at Wizards were trying to do with this, but it just didn't pay off. At least, not yet. I lost count of how many cards I have done. I'm not kidding. I legitimately do not know how big that was, but all I know is that it was worth every moment of writing it. I love this game quite a lot, and I love how fun and engaging it is to play. Rise of the Combiners takes that to a whole new level and brings in some of the most fascinating card combos I've seen to date and some of the most interesting physical card mechanics I've ever laid eyes upon in terms of the Combiner cards. March 1st is approaching fast, and my wallet is already screaming a high pitch, "No, daddy, please!" as I make plans to buy a box of product. But the cool part about all of this is knowing that Wizards of the Coast sees how well this game is doing, and how Competitive is right around the corner. But... That's it. 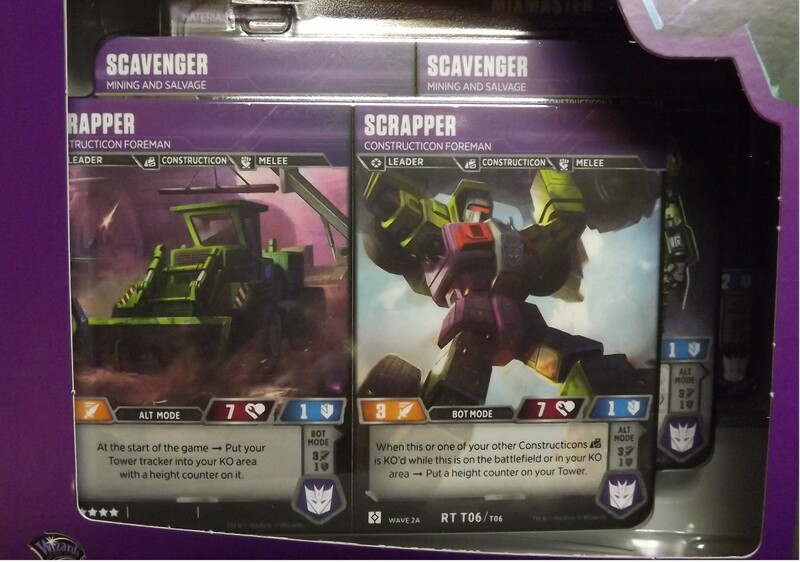 That's kind of everything we have until Devastator comes out with his exclusive Battle Cards and Wave 3. As always, it's a pleasure to write for Seibertron and it's even more of a pleasure to know that people actually read what I pour a frankly inordinate amount of time into! In all seriousness, though, I will be frequenting my YouTube Channel, Nanomachines to upload more coverage of new decks and competitive updates. I haven't been able to recently thanks to some hectic work schedules, but I've been really enjoying putting out content for you guys. What about you? What has been your favorite part of this set? Triplechangers? Combiners? Green pips? Omega Supreme? Let me know in the comments below, and as always, thanks for tuning in! Some cards, like Scrounge, Backup Beam, etc have a green icon. This icon can be swapped after a battle is over for a card in your hand once per battle. It's a fantastic way to build your hand. The general way to describe them is either "icon" or "pip" colloquially. I want to get into this game but I feel overwhelmed. ThT said, I am loving rhe artwork on some of these. Especially Steamroll. WHAM!! Wow! Seeing the tech cards here makes me want to bust out the eight packs of Rise of the Combiners I picked up from one of my Walmarts and see what I've actually got in 'em. Flashwave wrote: I want to get into this game but I feel overwhelmed. That's because it is. It's difficult to collect even ignoring the side sets like Metroplex and exclusives like Omega and the gold Bee above. Two boxes (edit: fixed, first version of this post was unintentionally wrong) will run ~$200 and you won't end up with all of a wave after, even ignoring "Super Rares"! That's insane. The rules already had what felt like one layer of complexity too many, and the new pips and combiners are just a line too far. I already wasn't enjoying it with the rule structure, now there's too much to follow to keep me invested in the gaming aspect. I'm not sure I'm going to keep up with it after Devastator. It's fun to flip through a binder of what really are nice looking cards after the fact, but I'd rather assemble the 419 out of 421 Power of the Primes cards that I have all over again than one wave of these things. ScottyP wrote: That's because it is. It's difficult to collect even ignoring the side sets like Metroplex and exclusives like Omega and the gold Bee above. Two boxes (edit: fixed, first version of this post was unintentionally wrong) will run ~$200 and you won't end up with all of a wave after, even ignoring "Super Rares"! That's insane. Actually, it's rather easy to collect most cards from the set for a pittance, especially after the set has been out for a while. Just look at wave one cards -- some of the character cards are around 10 cents! Of course, Nemesis Prime is still around $70 because he's a bit nutty, but there are always exceptions. If you'd like to build a deck, buying boxes is never a good way to do it. Instead, you should be buying singles from TCGPlayer or other online vendors that have the single cards up for sale. Plus, it's an easy way to finish off a few pieces of combiners! Flashwave wrote: I want to get into this game but I feel overwhelmed. ThT said, I am loving rhe artwork on some of these. Especially Steamroll. WHAM!! It really can seem that way from the surface -- the rules even took me a bit to firmly grasp after watching their instructional videos! But I do recommend that you check out some gameplay on YouTube to get a good idea on how the game plays. Heck, if you want to, you could pick up Metroplex and play with him to a competent degree right out of the box! 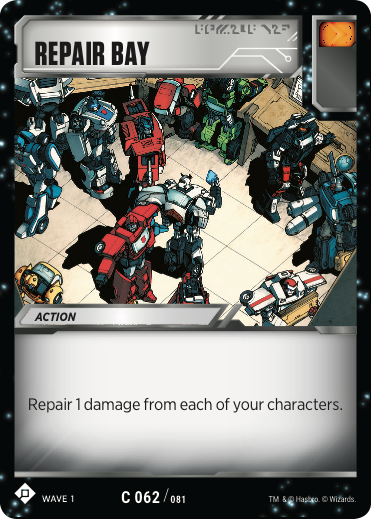 For all the fans of the Official Transformers Trading Card Game, we have a special treat to report, as one of the designers shared a little bit of what went into making the Battle Card Espionage, as featured in Wave 2: Rise of the Combiners. Ken Nagle wrote: I’m Ken Nagle, Design Lead for Transformers TCG. Today, I have a battle card from Rise of the Combiners I’d like to take a closer look at: Espionage. Espionage is a disruptive Action that I had designed and playtested in Wave 1. However, it felt like it fit much better in Wave 2 after introducing the green battle icon (After a battle, you can swap a card in your hand with one of your flipped green cards). 1. Since Espionage is a situational card, the green battle icon helps you find it when it’s effective or ignore it when it’s not. 2. Your opponent might have green icons as well, so you’ll often know a card in your opponent’s hand. 3. Adding another color to the game gives choosing a color with Espionage another wrinkle that we like. 4. Multicolor cards in Wave 1 like Matrix of Leadership and Roll Out! are just better because they are both orange and blue. We like that Espionage is better against these multicolor cards. 5. 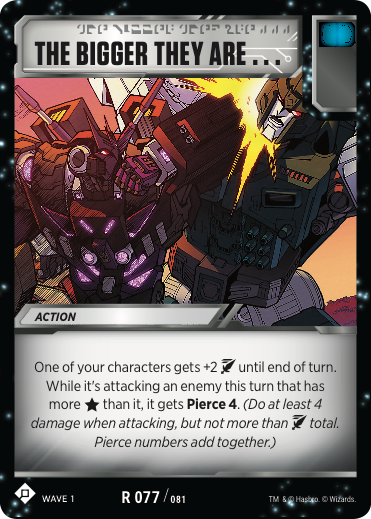 Rise of the Combiners introduces many Combiner teams, but some players will want some way to fight against their friend’s combiner deck. Since a Combiner can’t flip or uncombine (the rules would be just too messy) we know that once a combiner combines there’s no going back. 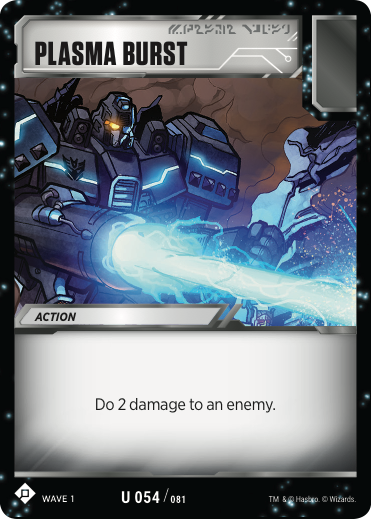 However, since a big combiner needs an Enigma battle card, there is often a chance to use Espionage to scrap your opponent’s Enigma just before they want to combine. It’s not foolproof, but it can do the trick! 6. Finally, playing Espionage has a high skill cap. You’ll have to decide when to play it, what color to name, which card of the opponent’s to take, and when to use the green icon to put it into your hand. Initially Espionage was just a green icon, but it wasn’t strong enough for a situational card that also requires skill to be effective. Espionage can’t do anything about an opponent’s Bolt of Lightning or other card with no battle icons. For those reasons we added a white icon since we liked the text box as is. Until next time, may your opponent be holding the right card at the wrong time. Did you find this helpful? Let us know in the Energon Pub and stay tuned to Seibertron for all the latest news and reviews! chuckdawg1999 wrote: Does anybody know if there's a one player option, like solitaire? I'm sure you can do that if you have 2 decks. I have done that with MTG and Yugioh back in the day. It's good to find holes in your strategy or weaknesses in your deck. I disagree with everything Sideways said. Physical adjusting is very important in this game(do 3 identical cycles). I ignore Optimus13,Mega13 and Nemesis,because they are too strong,as for the Sludge absorption. The new workO can make the backupP obsolete. I wrote leap twice for cosmo,i wanted the inspirationnal.For maximus,the Scheckpoint may be better than the pep.Acidstorm make Flamewar obsolete,the antibold can be a waste but there is two other magician. This sightings news comes to us from fellow Seibertron user Omega Scoopreme, as she has wrote in to us to let us know that she's found a mighty beast out in the wilds of Eugene, Oregon. For there at a Barnes and Noble, sat the latest addition to the Official Transformers Trading Card Game by Wizards of the Coast, the Devastator Combiner deck! As the name suggests, this deck is centered around the powerful Decepticon combiner Devastator and is playable right out of the box. The deck was available at the store for $24.99. Omega Scoopreme has kindly sent us pictures of the sighting, including the receipt showing where they purchased it. As this was due for release at the end of March, it's more than likely that you may have a Devastator Deck lurking on shelves near you now! Will you be picking up this deck to add Devesator to your collection? Let us know in the Energon Pub and stay tuned to Seibertron for all the latest news and reviews! It's spelled "DEVASTATOR!" You misspelled it in the title and repeatedly in the article. Not sure how new this is, or how long they have been but ironically in Richmond, Virginia I saw 6 of these at a Barnes and Noble. Neat packaging for sure. I got mine there on Saturday. Was looking for the Metroplex box online, and stumbled across it to my complete surprise, as I forgot the Constructicons even came in a box. I believe those were my first ever bought-online picked-up-in-store purchases (Metroplex at Gamestop), and I got each at nice discount: 15% off coupon at B&N, and Metroplex was only only $13 and change! As usual, just assumed I was the last to know. I didn't wrote the Devastator deck in page 15. He's completely ruined by the Predaking and his permanent anti heal,menasaur has zero chance to stop him.The extta KO?Just put the damage on low HP dude(brave attack in second). The idea of the sonic is to prevent the use of the enigma without loosing card for Bomb11. You'll need THREE of this armor. Basically a normal TF but on a normal-sized game card instead of a larger one. The original IGN article has one. Look for "Private Red Heat". 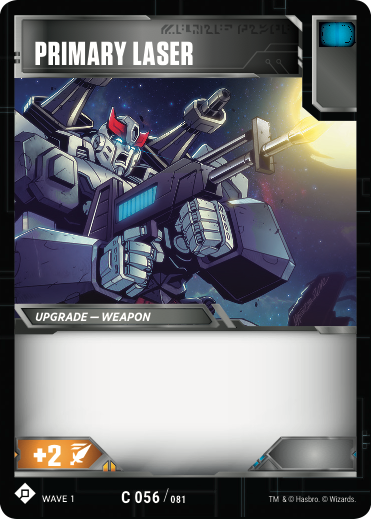 Thank to IGN, we have new card reveals for the Transformers Trading Card Game. These are part of wave 3, which is set for a June 28 release. 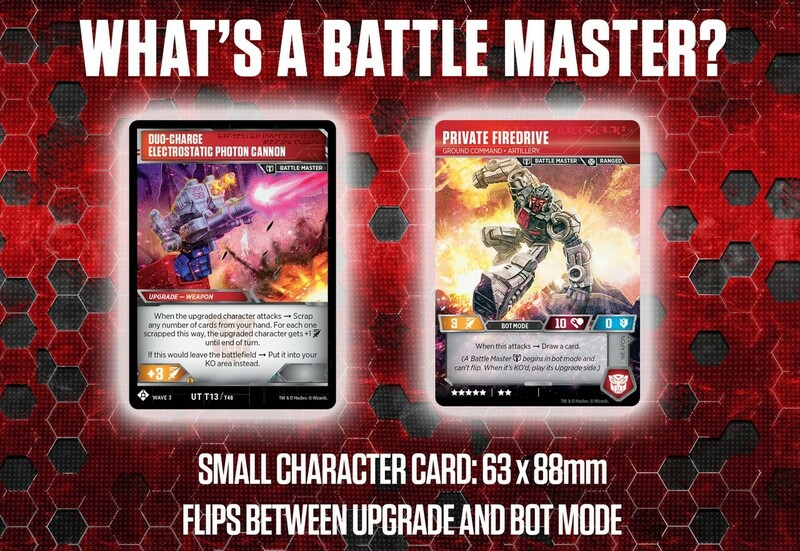 It introduces two new card types: Battle Master and Micro Master cards. 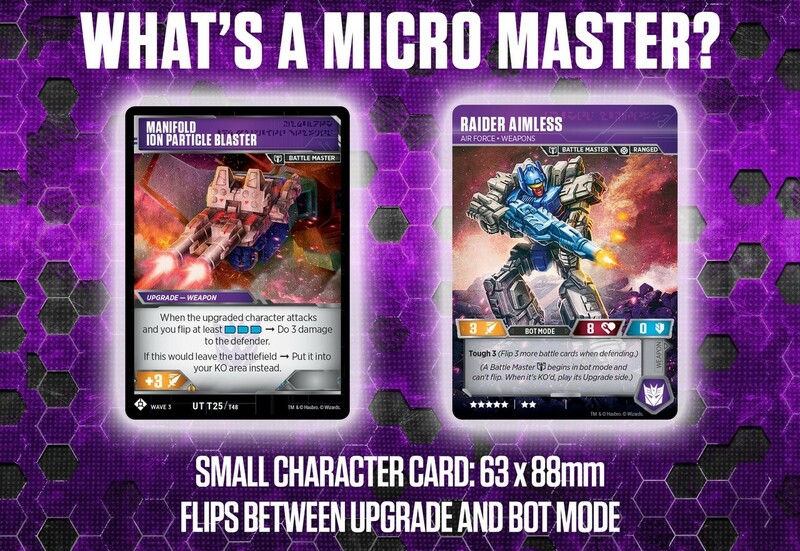 The new Battle and Micro Master cards will be much smaller. They will be 88mm tall by 63mm wide. This is part of adding the Transformers Siege theme to the card game. that also comes with new art based on the leader class toys Shockwave and Ultra Magnus. 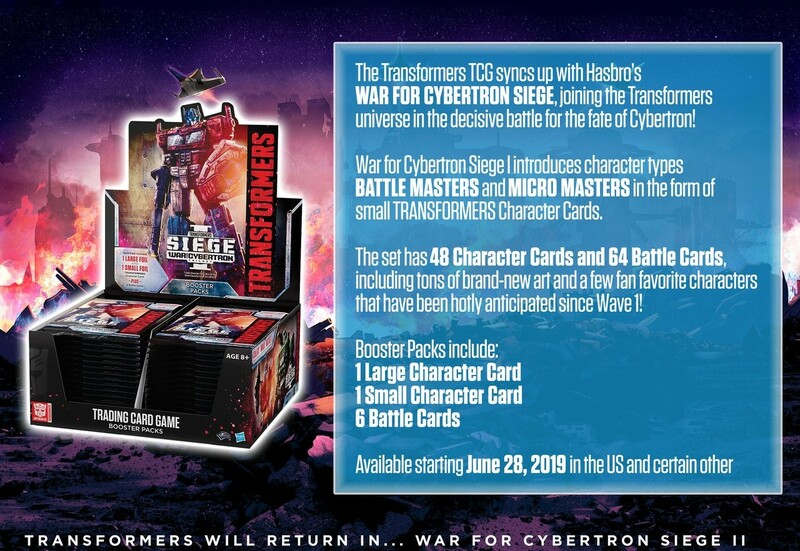 Each War for Cybertron: Siege pack will have two character cards in it: one large character and one small character. We will see some characters never been shown before in their original Cybertronian incarnations. Transformers is 35 years old this year. The age of youngsters being raised by the original generation of Transformers fans is such that they're at the point where parents are teaching them games, bringing them up as geeks and gamers. Each generation can enjoy this game at level that's appropriate for that age. These look great. The art work is incredible. A bit odd that the micromaster option is represented by a battlemaster but hey it is what it is. 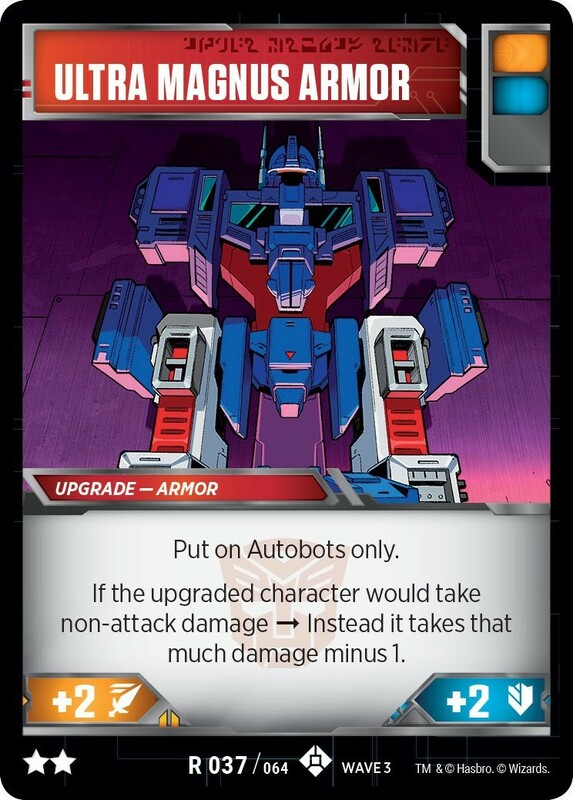 Okay, I'm not a big card gamer, so maybe someone can correct me if I'm wrong here, but does the Ultra Magnus Armor card basically translate to "-1 damage from a non weapon attack"
The bonus's on the bottom look nice, but the text just seems wordy. 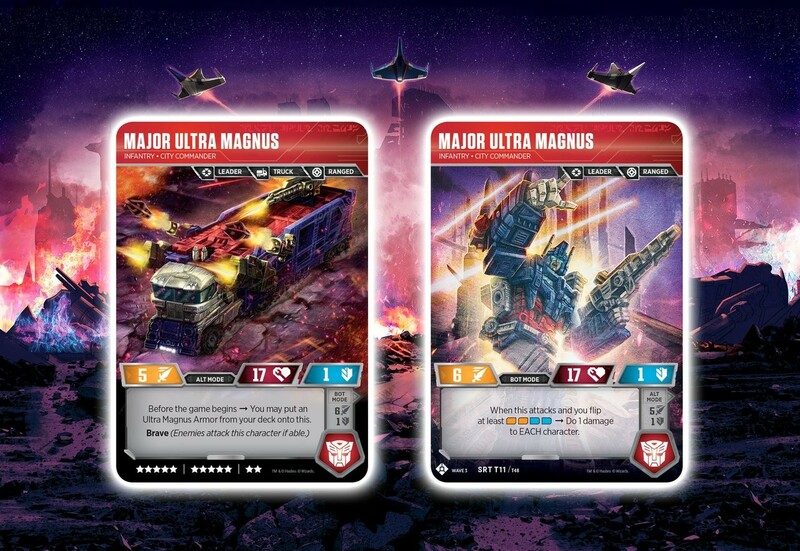 Rodimus Knight wrote: Okay, I'm not a big card gamer, so maybe someone can correct me if I'm wrong here, but does the Ultra Magnus Armor card basically translate to "-1 damage from a non weapon attack"
Half of he cards here are already out. The Warpath and all the Battle cards are from older sets. 4,683 pages were recently viewed by 761 unique visitors. This page was viewed 1 times on Wednesday, April 24th 2019 3:25pm CDT. © 2019 Seibertron, Inc. DBA Seibertron.com. All Rights Reserved. Established June 2000. Seibertron.com is owned by Ryan Yzquierdo.